Presented here, a wonderful folky oil on board of the New Hampton School in New Hampton, New Hampshire. The New Hampton School is located in the center of the small village of New Hampton, nestled on several hundred acres in the foothills of the White Mountains in New Hampshire's Lakes Region about 30 miles north of Concord. Chartered in 1821 to provide college preparatory education, it remains today one of the countries top boarding schools. This Oil on Board is beautifully executed with fine detail, yet retains the folky quality of a naive painting. It shows the school as it appeared in the second half of the 19th Century and the buildings pictured are Meservey Hall and Randall Hall. While many folk paintings sometimes ignore the laws of perspective, this one does not. 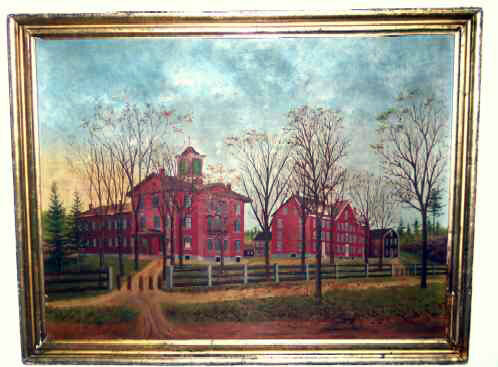 It is executed with skill, accurately depicting the school as it existed at the time, leaving for all a record of the institution and the rural New Hampshire landscape, perhaps from personal experience of having attended the school, or perhaps from just admiring the red brick campus, preserving the details of the time and the place. Framed in a lemon gold frame, it measures 24" long x 18-1/4" high (sight).